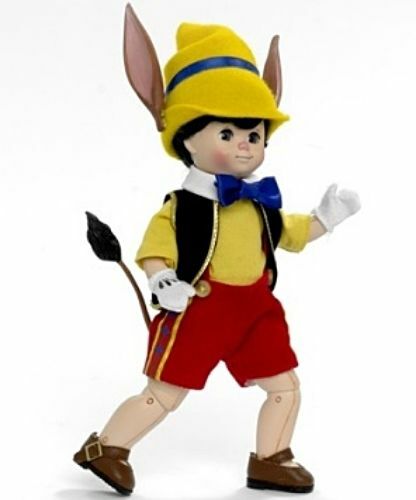 Looking just like a real boy, fully articulated Pinocchio is a Maggie doll made of vinyl. He features a new face stencil, blue eyes and a brunette boy cut. Everyone's favorite living puppet is dressed in a yellow cotton shirt with a blue bowtie, along with red flock shorts and suspenders. Over his shirt, he wears a black felt vest trimmed with gold braid. Brown Mary Janes, white gloves and a yellow felt hat, with a blue band and donkey ears, are great accessories - And his molded tail is the perfect final touch! As the beloved song says, this puppet hasn't got any strings to hold him up, but with articulated elbows and knees, you can pose Pinocchio in endless fun positions! A 2013 Spring edition from Madame Alexander's Disney Collection. Suitable for ages 14 and up. The original suggested retail was $104.96. Lyrics from "Pinocchio" Music and lyrics by Leigh Harline and Ned Washington I've got no strings To hold me down To make me fret, or make me frown I had strings But now I'm free There are no strings on me. 8-inch fully-articulated Pinochio, a Maggie with a new face stencil, blue eyes and a brunette boy cut, looks like a real boy. He’s dressed in a yellow cotton shirt, with a blue bow, and red flock shorts and suspenders that are accented with yellow buttons. The vest, worn over his shirt, is black felt trimmed with gold braid. Brown Mary Jane’s, white gloves with black details and a yellow felt hat with a blue band and donkey ears, nearly completes Pinochio. The final touch is the tail on his backside. She is recommended for for ages 14 and up. We also carry some vintage dolls and accessories. We love to combine shipping whenever possible. Thanks so much for shopping with us!! New: A brand-new, unused, unopened, undamaged item (including handmade items). See the seller's listing ..